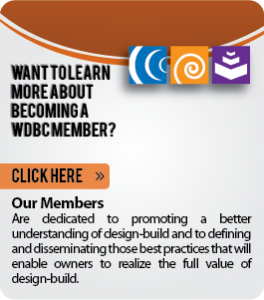 The WDBC was founded in 2006 to create a vocal and effective industry advocate for the value of alternative delivery methods for water and wastewater infrastructure projects and to promote best practices in design-build and CMAR procurement and implementation through education and outreach. WDBC’s Council’s charter members were Brown & Caldwell, CH2M Hill, CDM, Carollo Engineers, Earth Tech, HDR, Metcalf & Eddy, MWH and Veolia Water. These industry leaders shared the belief that this type of organization would be the most effective vehicle for developing a crucial education and advocacy program to promote the innovative design-build and CMAR approaches to delivering water projects. Prior to establishing the Council, these integrated and collaborative delivery approaches did not have a dedicated voice that could advocate effectively for legislation favorable to water quality infrastructure or counter opposition based on misunderstandings. Today’s membership is even stronger with AECOM water, ARCADIS-US, Black & Veatch, Haskell, HDR, and Parsons. Our Mission … To evolve best practices for successful implementation of water projects through collaborative delivery methods. We fulfill this mission by facilitating thought leadership with stakeholders through research, education and communication. As a not-for-profit organization, the WDBC seeks to advance the development and rehabilitation of the nation’s municipal water and wastewater systems through the use of the design-build and construction-management at risk (CMAR) methods of project delivery. These processes integrate both the design and construction phases to optimize innovation, speed, quality control, and single-point accountability.